Yesterday we looked at the dynamics of San Francisco real estate sellers. Today let’s swing around the lens to peek at the dynamics of San Francisco homebuyers. · 50 percent are first-time buyers, which is a very high percentage. Nationwide, this percentage is closer to 30 percent – and keep in mind that the U.S. median price is less than $200,000, while it’s more than $950,000 in San Francisco. · The average age of San Francisco homebuyers is trending younger; currently it’s in the mid-30s. · 47 percent of San Francisco homebuyers are in high tech. These young, often newly affluent buyers are playing a decisive role in the market. · 20 percent of prospective San Francisco homebuyers have grown discouraged and given up on buying in the city, either for the time being or permanently, having shifted their searches elsewhere. · Fewer than 3 percent of San Francisco homebuyers are foreign, and they are mostly investing in new or newer high-rise condo developments. · 26 percent of homes are being bought via all-cash offers, with many buyers getting loans either before or immediately after close of escrow. · About 10 percent of home sales are outside of the MLS, or “pocket” listings. According to the Planning Department, the approximate number of new housing units added since 2010 is 4200. Contrast that with the U.S. census’ estimated increase in the city’s population during that time: 32,000. It doesn’t take a math genius to see where the upward pressure on rents and home prices is coming from. Recently Paragon agents were surveyed informally with regard to their past 12 months of activity. While the analysis and survey were not rigorously controlled, Paragon is one of the four biggest residential brokers in the city and thus offer a fair sampling of what’s going on out there. · 60 percent are willing to leave the city. This is for reasons including schools, affordability, job-related reasons and retirement. · 15 percent of sales transactions involve trust, probate or investor sales, or people moving into rentals or retirement homes, with no new home purchase involved. · 25 percent wish to buy another property in the city, either upgrading to a more expensive home or downsizing to a smaller home. Perhaps the biggest single reason for selling is to relocate for what are seen as better public schools outside San Francisco, or to enroll kids in suburban public schools rather than pay the price of private schools in the city. Some city homeowners are also finding themselves motivated by high prices to cash out in the city and buy bigger or better elsewhere. In addition, frenzied market conditions are discouraging homeowners who might otherwise sell to buy other homes within the city. Many of these homeowners are instead staying, which in return pushes down listing inventory. Tomorrow we’ll look at buyer dynamics. · 1 in 9 sold below asking price by at least 1 percent. What can we learn from this pattern? If you are buying, start your search in a price range below what you are willing to pay. If you have been waiting to sell until your home’s value hit a particular price, now may be the time to make a move. If you are selling, list your home below its anticipated selling price. Listing it right where you expect it to sell could be a mistake. Case in point: a stunning three-plus bedroom/three-bath home west of Twin Peaks worth more than $1.5M is sitting because it was listed for $1.6 million. And a condo in the Castro worth between $750,000 and $800,000 just went through a price reduction after being listed north of $800,000. These properties now have a stigma and will likely sell for less than top dollar because they weren’t positioned for a bidding war. For buyers, a corollary to number three is to study inventory that has been sitting instead of selling. There may be values among these properties as the rest of the market shifts its focus to the next new hot listing. Curious about the state of San Francisco construction? Check out the latest version of the San Francisco Pipeline Report, which covers the fourth quarter of 2013. As of the report, there are 857 projects in the pipeline. Of that amount, 74 percent are exclusively residential and 17 percent are mixed-use with both residential and commercial components. Just 8 percent of the projects are non-residential. That means a total of 50,400 units are set to be added to the city’s stock. This is considered high relative to historical figures. About 18 percent of projects are currently under construction. Around 20 percent have received the necessary approvals. One in three projects have filed building permit applications with the city. Wondering what to do with your own piece of San Francisco paradise? Get in touch! In the case of South Beach, they couldn’t have been more wrong. No one with a sense of local history would have blamed the SFAR if they’d take their task a step further, splitting the new District 9H into at least three separate mini-districts: the South End, South Park and Rincon. If these names sound familiar, they should; each played a role in early San Francisco history. There was a time when a South Park or Rincon Hill address meant more than one on Nob Hill or Pacific Heights. Long before “little cable cars climb(ed) halfway to the stars” San Francisco’s elite built their mansions “south of the slot,” on Rincon Hill, located in the northeast quadrant of today’s South Beach and in South Park, a gated development located on Rincon’s southern slope, modeled after a neighborhood in London, England. South Park featured San Francisco’s first paved streets, along with mansions and elegant row homes. Rincon Hill was the Pacific Heights of its day. During the 1850s and 60s, says historian Charles Lockwood, “dozens of large, comfortable homes were built (on Rincon Hill) that reflected the era’s popular architectural styles: Greek Revival, Gothic Revival, Italianate and Second Empire.” Unfortunately, its reign atop the San Francisco class heap was short. In 1869, the neighborhood was literally cut in half by the Second Street cut (an effort to make it easier for wagons to get from downtown to the southern waterfront). By the 1880s, author Robert Louis Stevenson was referring to Rincon as “a new slum.” The transition of Rincon/South Beach from wealthy to working-class had begun. It’s difficult now to imagine Rincon Hill not only as a residential neighborhood of free-standing mansions but also as an actual hill. In fact, it was once 120 feet tall. The Second Street cut started a process that eventually leveled it. The Southern end of South Beach also contains a game-changer for the entire district: AT & T Park. After several years of flirting with other sites, including the railroad yards at Seventh and Townsend Streets, the San Francisco Giants broke ground for their new stadium at King and Third Streets in 1997, transforming sleepy South Beach into a vibrant neighborhood of middle- and high-end apartments and condos, restaurants, bars and shops. On game days, Second and Third Streets teem with baseball fans. Hot spots like MoMos and Pete’s Tavern overflow with patrons wearing black and orange. This end of South Beach was created in a manageable scale, mixing mid- and high-rise blocks with The Embarcadero’s open space and breathtaking bay and bridge views. Not so the rebirth of Rincon Hill. The northern sector of South Beach, was developed after the southern end and chose a flashier approach more in keeping with its proximity to San Francisco’s Financial District. The new Rincon features spectacular residential towers, world-class restaurants, street-level buzz and a seemingly non-stop appetite for growth and action. In some ways, Rincon seems an outgrowth of neighboring Yerba Buena, with an emphasis on full-service residential communities and a “live here/work here” ethos. It features high-end and boutique hotels and has a subtle ace up its sleeve – easy access to San Francisco’s ferry building and ferry docks. Other than Yerba Buena it’s difficult to imagine a more Manhattan-like neighborhood in San Francisco – or one presently showing more obvious signs of future growth. Two corners of the intersection at Folsom and Beale Streets, for example, sport large-scale construction efforts in their early stages. But South Beach is more than Rincon, its towers and its cranes. South Beach is also South Park’s quiet central park, King Street’s exciting commercial strip, The Embarcadero and everything in-between. The signature One Rincon towers, visible from all over the city, make Rincon hard to ignore, though. To be certain, the San Francisco Association of Realtors knew what they were doing when they gave South Beach its own designation. The only question is if they went far enough. Home price index: How does San Francisco stack up? MyLife.com has created a chart comparing prices in 30 U.S. cities with the aim of seeing how prices have changed both before and after the crash in 2008. It accompanies this article and offers an interesting glance at the market’s state of affairs both yesterday and today. It won’t surprise you that San Francisco is up in the pretty high stratosphere, second only to our old friend New York and followed by Washington, D.C., Honolulu and San Diego. Bringing up the bottom are Jacksonville, Florida, Louisville, Kentucky and Atlanta. What do I need to know about title and escrow fees? So you’ve finally hit that point of pride (and a little bit of nervousness): you’re headed to the title or escrow company and preparing to take official ownership of your new house. This will also be the day when both you and the seller are expected to pay closing costs, which are a bundle of separate charges that go to different entities for all the services associated with the purchase and sale of a property. Q: What services do closing costs cover? A: Items including loan fees, advance payments such as property taxes and homeowners insurance, and appraisal fees. Q: What should I expect to pay in closing costs? A: While these will vary, expect to get an estimate after you submit your loan application. This is considered a good-faith estimate and is mandatory under the Real Estate Settlement Procedures Act. Q: Can I pay my closing costs in installments? Q: Can I pay closing costs with a personal check? A: Nope. Try a cashier’s check issued by a California institution. Personal checks may either delay the process or be unacceptable to the title or escrow company. Q: Must I by law buy title insurance when I buy or refinance a home? A: There is no such law in California. However, nearly all lenders require title insurance for the face amount of their deed of trust in the case of both purchase and refinance. With high-quality inventory at a critical low in the city, every great new listing that comes on the market is a reason to celebrate. I present to you 451 Kansas Street #458, a two-bedroom, two-bathroom condo offered at $850,000. 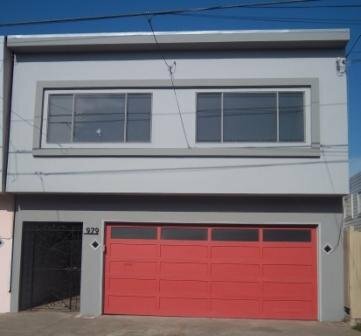 This Potrero Hill gem has parking for one car, a washer/dryer, and closets for days. A professionally managed building, The Potrero offers ideal floor plans with this particular unit featuring bedrooms set to either side of the living room with their own ensuite baths. Extra features include walk-in closets, hardwood floors, stainless GE Profile appliances, glass shower doors, and custom window coverings. Outside features include mature landscaped courtyards, a fully equipped gym and spectacular roof deck with stunning city views.